You know how sometimes you see a recipe and think… oh yeah, that sounds nice… but then never actually make it. Please don’t do that with this one. This homemade whipped body butter is pure gold – and honestly – I think you’re going to love what it does for your skin! You’ll learn to toss out the toxins, and surround yourself with beautiful skincare that you confidently make yourself! Coconut Oil is a top favorite of mine. Always use a virgin cold-pressed oil, organic is best, to make sure that all the nutrients and beneficial properties are intact. Coconut oil’s antioxidant properties protect the skin from free radical damage and because it’s so full of essential fatty acids, it also helps to build and strengthen skin-cell structures. This keeps the skin’s connective tissues strong and supple, which helps to prevent sagging and wrinkles. My skin loves it and I love that it’s easily absorbed. Cocoa Butter comes from the cocoa bean. It has a distinct nutty, chocolate scent – so yes, you will smell… delicious! When I use it on my skin, my 5-year-old notices right away! Cocoa butter is a rich emollient, it leaves your skin buttery soft. It contains fatty acids which help to retain moisture and build elasticity and also has properties which can help ease dermatitis or rashes. And did I mention it smells like chocolate! Just like your oils, you want to choose a raw, cold-pressed butter – free of chemicals that are used in bleaching and refining. Let’s start making our Homemade Whipped Body Butter! Cocoa Butter is solid, so you’ll need to melt it down in a bain-marie, a hot water bath. You want it to melt over steam, rather than direct heat. Depending on where you live, and if it’s cold, your coconut oil may be hard…. melt them gently together until completely liquid. Once the butter is melted, you’ll need to harden it in the freezer for about 20 minutes. TIP: make sure to cover the container in the freezer (with a lid or towel) so that no condensation drips into your butter! Freeze it until it’s semi-solid – not too soft, not too hard. You should be able to press your finger in easily and make a dent. If it’s not whipping up, put it back in the freezer to harden a little more. Now, I want to tell you something up front so that you’re not weirded out when you use it. This body butter is unusual in that it melts onto your skin the instant you apply it – like butter on a hot pan. Honestly, I found it to be a bit strange. The recipes that I had read don’t tell you this, so when I first used it, I thought it was greasy and that I wouldn’t like it. But then, something magical happened – my skin soaked it all in – and instead of feeling greasy, it felt velvety soft! My skin is seriously thanking me and has promised to glow, if I use this everyday. This homemade whipped body butter is pure gold - and honestly - I think you're going to love what it does for your skin. And with just two ingredients, it couldn't be simpler! Set in the freezer to harden, about 20 minutes. Whip about 5 minutes, or until you have created fluffy white clouds. Spoon it into a clean jar or container. It will keep for 3 months. Cold climates, adjust recipe to 60% cocoa butter, 40% oil so that it's not as hard. Store in a clean glass jar and keep in a cool, dark place. Your body butter will keep for up to 3 months. I hope enjoyed this article – if you did please share it with your friends on Facebook, Pinterest or Twitter! And if you want more, join 17,000+ subscribers who receive a new recipe in their inbox every Tuesday by signing up for my newsletter! A total disaster. Would never whip, no matter what temperature it was at. I added all the coconut oil and all the olive oil in my house and am still sitting here crying as it fails to whip after three days of trying. Hi,I’ve been reading comments about the whipped lotion getting hard & disagree with everyone wanting to change it. I live in upstate ny, it’s 0° out, yes my lotion got hard but all u do is take a spoon scoop it out rub in your palm, it melts & then apply to your body, it’s awesome! 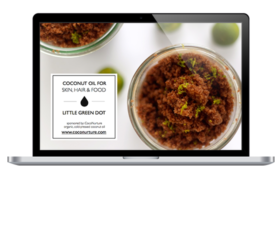 My skin is soft, smells great, plus coconut oil& cacao butter are so good for your skin. Thank u militzia for the recipe? Mmmm! I want to make it straight away! ;) I live in Mauritius, we have good quality local coconut oil, but for cocoa or shea butter need to try find it here…))) Thanks a lot for everything you share with us!!! Just adore all your recepies! This works great. I whipped in my kitchen aid mixer for like 5-10 minutes I used even amounts of coconut butter and Shea butter and a tad of almond oil. Scented the butter in small batches different scents. I made this with shea butter and coconut oil. The consistency is perfect and soft but it takes a long time to absorb. try adding 1 tbsp of cor starch. Makes it less greasy and feels wonderful. I add this right after i pull the melted butter/oil off the heat. I made my first attempt at this body butter using cocoa butter, sweet almond oil and I added a little aloe. After the melting and cooling process, I added Frankincense, Myrrh, Helichrysum, Lavender & Copaiba. I didn’t have a mixer so I whisked by hand. After a just a few minutes of whisking the mixture began to harden. How can this be corrected? I was afraid to re-melt it as I wouldn’t want to harm the Essential Oil’s properties. SO I transferred the butter into a tub but it is crumbly and hard. Any advice? Thank you! For all the cold climate people out there I had to add about half a cup of olive oil to make this usable! Damn Wales! Half a cup of oil wasn’t enough as it soon seized again! Reheated it, added another full cup of olive oil and half a cup of Shea butter and it’s a lot better now, a far lighter whipped body butter. Maybe be worth going for a recipe with more oils/ softer fats if you’re from a colder part of the world like me. Hi! I have had hits and misses, and found that I like grape seed oil for most of my recipes. Is it possible to substitute grape seed oil for liquid coconut oil? I realise that it doesn’t whip as well, but for my skin, (aging and dry) i find it absorbs and stays a bit longer. do you know what the measurements are by weight? Hi there – I made it and my kitchen smells edible! Insanely beautiful smell. I just found it got hard after a bit of sitting. Would you suggest adding more coconut oil? I would take any suggestions. Really, Info please. Email me at [email protected]. Hi, this butter looks divine! going to try this during winters instead of buying lotions and butters from the market. However I have one query, I have a block of Kokum butter at home, can I substitute Cocoa butter. If yes then can you help with quantity? Hi Nidhi! I haven’t used kokum butter personally, I do know that it’s used often as a cacao butter substitute. Maybe try the same proportions, and remember that climate does effect the outcome. If it’s hot or cold where you live you might get a different result. If your body butter comes out too thin, you can remelt it and add in more kokum butter. If it comes out too hard, you can remelt it and add more oil. Question 3 – do I need any frangrance oil? Im sorry to take your time but I will appreciate your assistance. Lovely! Are the measurements after oils are melted to liquid? hi, please as African, can this recipe be applicable and how do we get the ingredients in Nigeria. I hope it’s not too late to respond. Sign me up for the Little Green Dot newsletter!